Congratulations to the winners of the fourth Bloomberg Philanthropies Awards for Global Tobacco Control. 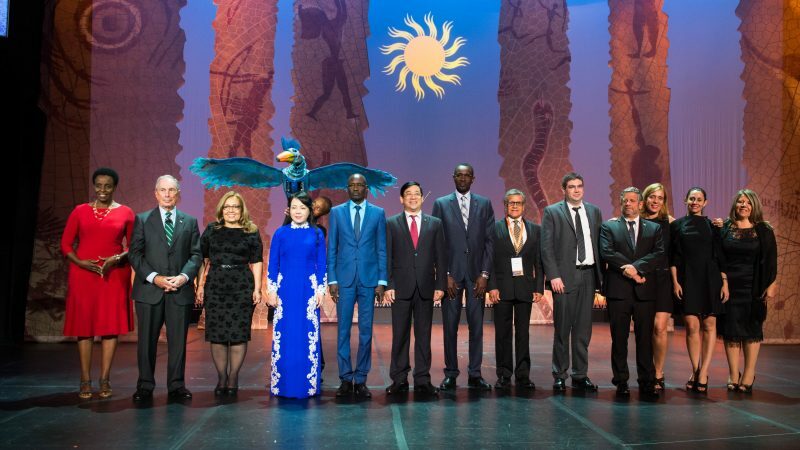 Each organization showed a strong commitment in the fight against this global epidemic, and we celebrated their success at the World Conference on Tobacco or Health in Cape Town, South Africa. Each of these organizations has taken measurable actions to reduce tobacco use, combat Big Tobacco and show the power of what is possible in creating better, longer lives for the people in their communities. Vietnam has shown excellent leadership in tobacco surveillance and monitoring by conducting two rounds of adult tobacco surveys and three rounds of youth tobacco surveys. In addition, the country has monitored tobacco use in special populations by integrating tobacco questions in surveys focused on special populations (for example, a labor force survey). El Salvador passed comprehensive smoke-free legislation in 2015, made possible by FOSALUD’s leadership. FOSALUD not only conducted evidence gathering (e.g., air quality monitoring, development of fact sheets, etc.) to support advocacy for the law in its initial phases, but engaged the international community for help when tobacco industry interference became evident. FIC Mexico worked closely with the Mexican government to develop a strategy to broaden the availability of evidence-based tobacco dependence treatment. They worked with 10 government institutions, along with clinical experts, to develop and implement national guidelines, and capacity-building support was extended to health care professionals beyond established clinics, making basic treatment more readily available to Mexican citizens. In March 2014, the National Assembly of Senegal adopted one of the strongest tobacco control laws in Africa, including smoke-free provisions, advertising bans, and prohibiting industry interference, but the most prominent measure remains the pack warnings. The law requires that tobacco product packages must display a combination of text and picture health warnings on at least 70 percent of each principal display area. Uganda enacted a comprehensive tobacco control bill in 2015 that includes regulations on tobacco advertising, promotion and sponsorship (TAPS). The Ugandan CSOs, through their well-coordinated advocacy and communications efforts, played a crucial role getting the bill enacted into law, and to this date, they continue to work collaboratively with the Ministry of Health on the development of implementing regulations, as they have also been strongly advocating for enforcement of the Act. The Argentinian Government, under the leadership of the Ministry of Treasury and the Ministry of Health, strongly supported by the Inter-American Heart Foundation (FIC), approved in May 2016 a tax of 75 percent (ad valorem) on national and imported cigarettes. FIC Argentina worked closely with the MOF and MOH to advocate for the tax increase, including several technical meetings that involved developing documents on price gap and cheaper brands substitution, other tobacco products substitution, specific tobacco tax in the Argentine case, tax increase and tobacco subsidy, worldwide taxes and the 70% tax as the share of the price recommendation. See photos from the Awards on Flickr.